I suppose, since February is upon us, a picture of snow and ice is more appropriate though I am always inclined to reflect on some Caribbean Island beach with palms swaying in the breeze and sunlight dancing on the water. 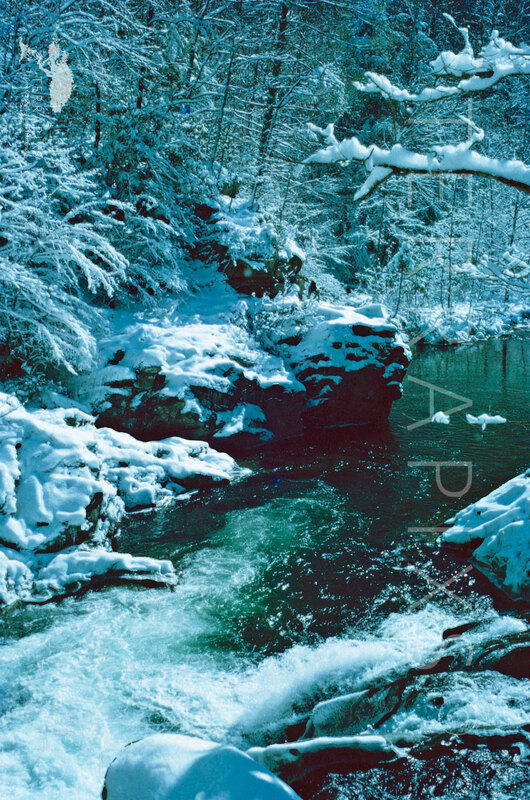 In any event, and in tribute to winter’s beauty, this Print of the Month was taken in the Great Smokey Mountains National Park (SMNP), more specifically of a stretch of Little River called “The Sinks”. The snow was 12 to 14 inches deep at the time this picture was taken. Not another soul was anywhere to be seen. There is something about a thick mantle of snow. It cleanses and the hush of winter pervades everything. Were it summertime, any number of young people would be seen jumping off that rock you see jutting out from the cliff. It would be quite a shock to do that in deep winter! SMNP lies along the boundary of east Tennessee and western North Carolina. The Park is a UNESCO World Heritage Site with incredible biodiversity that straddles the ridgeline of the Great Smoky Mountains, part of the Blue Ridge Mountains which, in turn, are part of the Appalachian Mountain Chain that runs from Maine to northern Georgia and Alabama. The Park was dedicated by President Franklin Delano Roosevelt in September 1940, saved from logging interest by way of a massive public outcry. It is the most visited National Park in the United States and encompasses 577,419 acres making it one of the largest protected areas in the eastern United States. They are called the “Smoky” Mountains in reference to the haze produced by terpenes and related aromatics given off in abundance by the various conifers (spruce, fir, pine) inhabiting the ridges. But what of these Appalachian Mountains and why are they so different from the rugged Rocky Mountains or the Grand Tetons? Well, first off they are a very old mountain chain, at least 400 million years old which is why there are scant few fossils, the rocks simply formed for the most part before the breakout of higher life on our planet. They began rising during the Paleozoic era the result of shifting crustal plate tectonics. In fact, Grandfather Mountain, elevation 5,160 feet, is estimated to be 1.8 billion years (the earth is est. at 4.5 billion)and is the oldest rock formation in the world. You already have the answer to the above question. Wind and water erosion over countless millions of years have drastically lowered the once mighty Appalachian chain that was some five miles high and looked like the much younger Rockies out west. So, the peaceful streams of SMNP belie the violent birth, raising and gradual erosion of the Parks vista’s. Now, it is protected space and grand it is so go and enjoy it and appreciate the processes that brought it forth from mother earth.